Duty to God and country, Duty to others, and Duty to self. The Scouting program emphasizes community service and the development of skills in self-reliance and leadership. Boy Scouts is an organization for boys, but could not flourish without families such as yours. By belonging to a troop, your son can make new friends, enjoy many campouts and activities, learn leadership skills, work towards earning merit badges, and move up in rank as he heads towards the highest rank of all --Eagle Scout -- if he so chooses. These opportunities are available to your son and we want to help him achieve all of his goals. Your interest and participation will help your Scout take pride in himself and help him attain the goals he has set for himself. This handbook is designed to help answer many of the questions you may have about Troop 162. However, please feel free to call any of the Troop Leaders or Committee Members for any other information. Your son should call his Patrol Leader when he has questions about his patrol activities. We look forward to getting to know each of you and having fun together in Scouting. Troop meetings are held every Thursday of the month, unless otherwise announced. 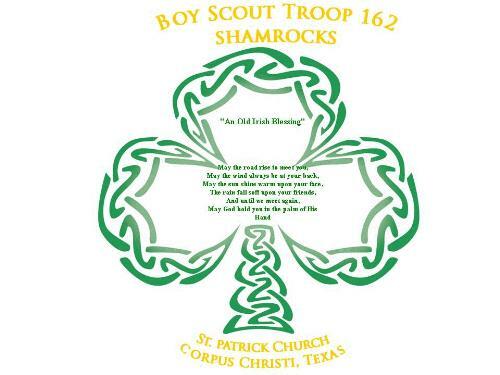 Meetings are held at the Troop 162 Msgr. owner of the medical building, Dr. Garcia, an Eagle Scout himself, has graciously allowed us to use his parking lot after hours. to not leave any trash on the premises. If you are interested in becoming part of our troop, please come to one of our meetings.